Since it’s approaching Shrove Tuesday (pancake day to most….) and there’s plenty of bags of flour, eggs, and sugar lining the supermarket shelves, it seems like now would probably be the best time to introduce a healthy and interesting alternative to the classic pancake recipe…. This recipe uses ground oats and buckwheat, making it a mixture of both healthy grains and protein – buckwheat is also gluten free, as it’s not actually ‘wheat’, it’s a seed related to the rhubarb family. Maca has plenty of well known health benefits, such as boosting energy and mood levels, (also libido), regulating hormone function, and is also used by many people to help clear acne and maintain healthy skin. Carob is a new ingredient to my kitchen, and is definitely here to stay…. 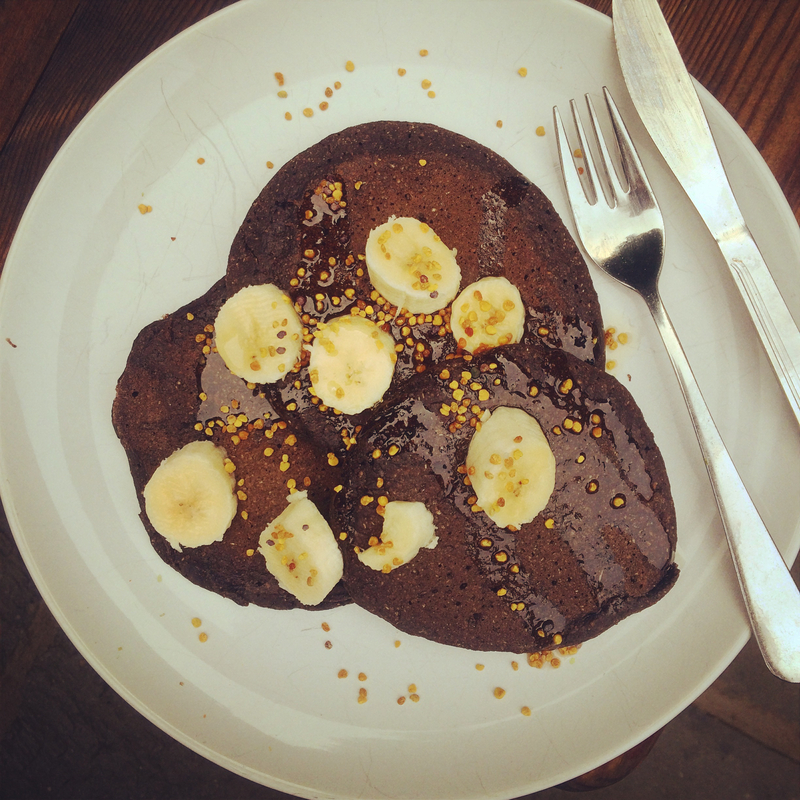 It’s often used as a chocolate substitute, (which is why the pancakes are brown – they’re chocolate, not burned!) and is full of the natural chemical selenium, which is essential for healthy brain function, and it’s often advised that someone up their intake of selenium if they’re suffering with stress and low mood levels. (Brazil nuts are another great source of selenium, as are apricot kernels). One of the most surprising things about this recipe, is the fact that the mixture of carob, maca and vanilla extract actually means that the pancakes already taste as though they’re covered in maple syrup, yet there’s absolutely no sugary substance in the recipe whatsoever! While they taste actually quite indulgent and naughty, these are healthy enough to be eaten for breakfast or as an afternoon treat, as they’re full of all-natural, wholesome ingredients that will keep your energy levels sustained – and your sweet tooth satisfied – for a long period of time. Using a large spoon, scoop big dollops of mixture into the pan and spread into a small, even pancake shape…. Some will turn out more pancake-like than others…. Cook for around 2 minutes as a rough estimate, or until small bubbles start to form on the top layer, then flip and cook for a minute or two more on the other side. Depending on how big you like your pancakes, this will make around 10 or more, so if you’re cooking them all at once you can either share them with everyone, or wrap the leftovers in a cloth and keep for breakfast. (They can be easily heated up again by wrapping in foil and placing in the oven at 200 C for about 10-12 minutes). Other than an excuse to eat a lot of pancakes, Shrove Tuesday is known as a time for self-reflection (or as it’s known in the Yogic texts, svadhyaya – ‘self study’) this is a time to reflect upon any areas of life in which we wish to grow and develop, and consider what we might do to work towards positive personal growth….. It’s also known as Mardi Gras in French, or ‘Fat Tuesday’, which invites us all to spend one last day eating richer, indulgent foods before Lent begins on Ash Wednesday, so maybe save the self study and self reflection for after the feasting….